Getting funding for your indie film is not going to happen unless you do two things. You’ve got to believe it can happen and believe you can make it happen. It all starts with manifesting your success. 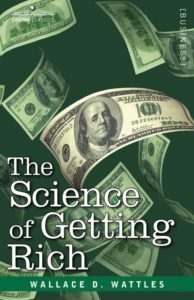 In my previous blog, I introduced Wallace D Wattles and his book The Science of Getting Rich. Written in the early 1900’s, Wallace was a pioneer in discovering and writing about the using the power of the mind in changing your life, creating your success, empowering your creativity. In my new video, The Science of Getting Rich Part 2, I go into how Wattles explains how everything you see on earth is made from one original formless substance. This substance is a powerful energy that we’ve yet to harness. Wattles says Man can form things in his thoughts and, by impressing his thought upon what he calls the formless original substance of energy which forms the universe, he can cause the thing he thinks about to be created. For you to do this you need to acquire the ability to think the certain way; this is the first step toward getting rich. There is no labor from which most people shrink as they do from that of sustained thought; it is the hardest work in the world. This is especially true when truth is contrary to appearances. For example, to look upon the appearance of disease will produce the form of disease in your own mind, and ultimately in your body, unless you hold the thought of the truth, which is that there is no disease it is only an appearance and the reality is health. To do this requires power. He who acquires this power becomes a MASTER MIND. They can conquer fate; he can have what he wants. We must grasp the truth that every thought held in this substance becomes a form. The universe desires that you have everything you want. Your purpose must be in alignment with nature. Therefore, you want to get rich in order that you may eat, drink and play a good part in helping the world to find truth. You can help others by making the most of yourself than in any other way. Most of all, this “original substance” will make things for you but it will not take things away from someone else and give them to you. You are here to create, you are not here to compete for what is already created. Get rid of the thought of competition. Become a creator to get what you want. Supply is not limited. Please believe this. It frees you to create. Know that the money you need will come. Always look at the limitless riches in formless substance and KNOW that they are coming to you. Never worry. Keep your mind on your vision. You can create form from the formless structure around you. Example, if you want a new machine, hold the mental image of it with the most positive certainty that it is being made or on its way to you. After forming the thought, have the most absolute faith that it is coming. This thinking substance has created all the machines already made and will cause the creation of one for you when you set it in motion by desire and invincible faith. What and how to you ask for things? We will cover that in part 3 of Wallace D. Wattles brilliant book the Science of Getting Rich. This entry was posted in Uncategorized and tagged Carole Dean, film funding, manifesting, mind power, Success, wallace d. wattles by Richard Kaufman. Bookmark the permalink.